Yesterday, 20 de noviembre, was el Día de la Revolución (Revolution Day), but you wouldn’t know it in Oaxaca. For the second year in a row, the parade was canceled — last year it was due to protest threats by Sección 22 of the teachers union and this year because the governor declared that it was a work and school day, so there should be no desfile to distract students and their maestros. Besides, in 2005, Article 74 of Mexican labor law established the third Monday of November as the “official” holiday — thus following the USA’s “time-honored tradition” of creating 3-day holiday weekends and setting the stage for 3-day shopping frenzies. Mexico is following the latter also — we got caught up in the crowds of “Buen Fin” shoppers in Guadalajara last Sunday. 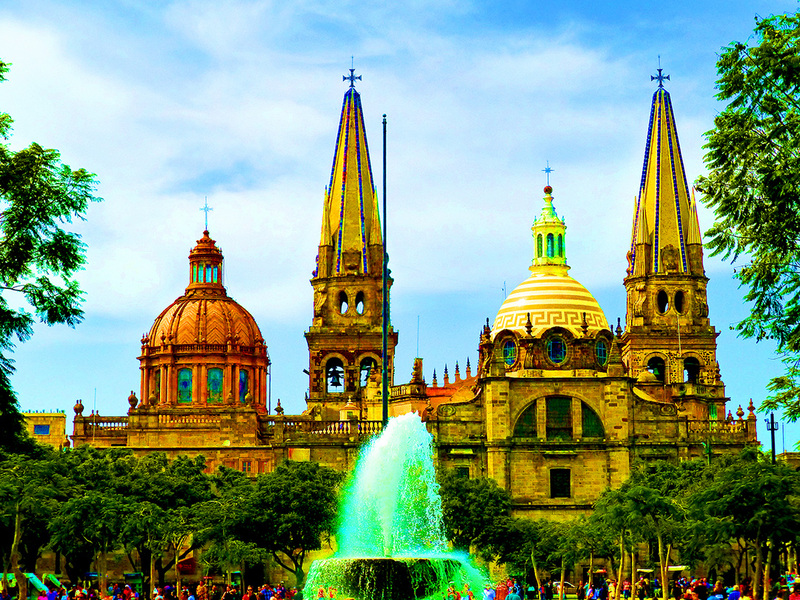 However, Monday, I was en route from the Guadalajara to Oaxaca aboard the new non-stop flight by TAR airlines. 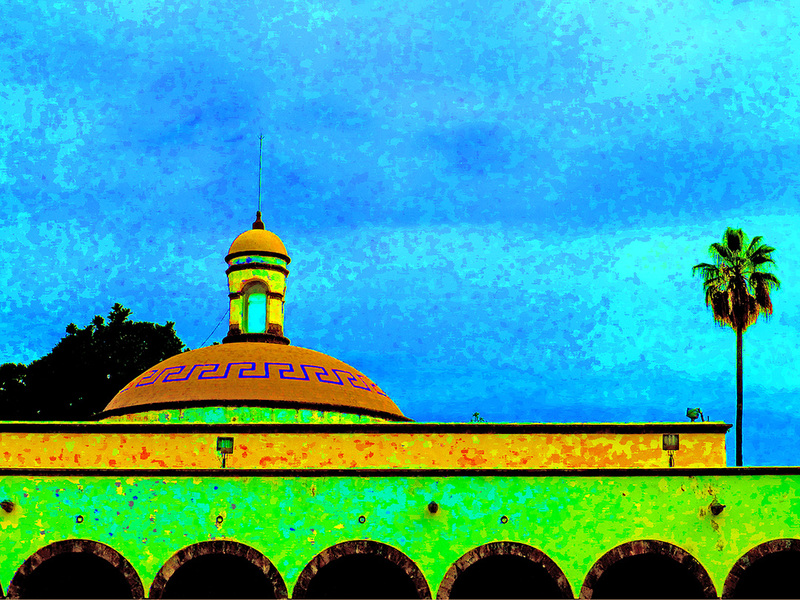 Upon my return in the afternoon, I didn’t see or hear of anything special happening in Oaxaca city and there weren’t even any fireworks from the zócalo or Plaza de la Danza that night. 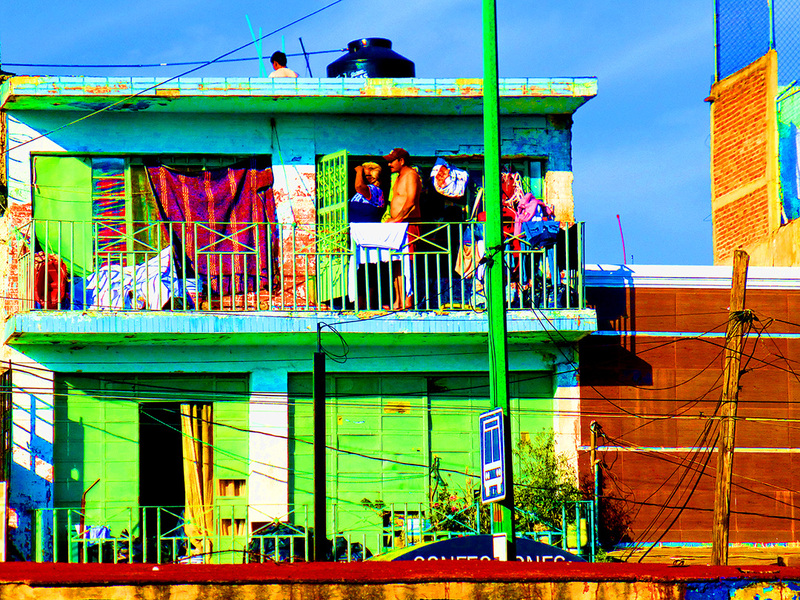 So, in lieu of a revolution-related blog post, I’m returning to the above mentioned visit to the state of Jalisco for a few super-saturated scenes from my seven hours in Guadalajara. It’s great to be back under Oaxaca’s spell! However, though not enchanted with Guadalajara (hence the desire to add pixie dust to the photos), it has some spectacular Orozco murals at the Palacio de Gobierno and the Instituto Cultural Cabañas. Today is the 104th anniversary of the Mexican Revolution. However, there is no joy; most of Mexico is in mourning for the missing 43 students and the anger is building. In Mexico City the military parade and celebrations will be moved from the Zócalo to a military installation in the Polanco neighborhood. A mass protest march will replace it. 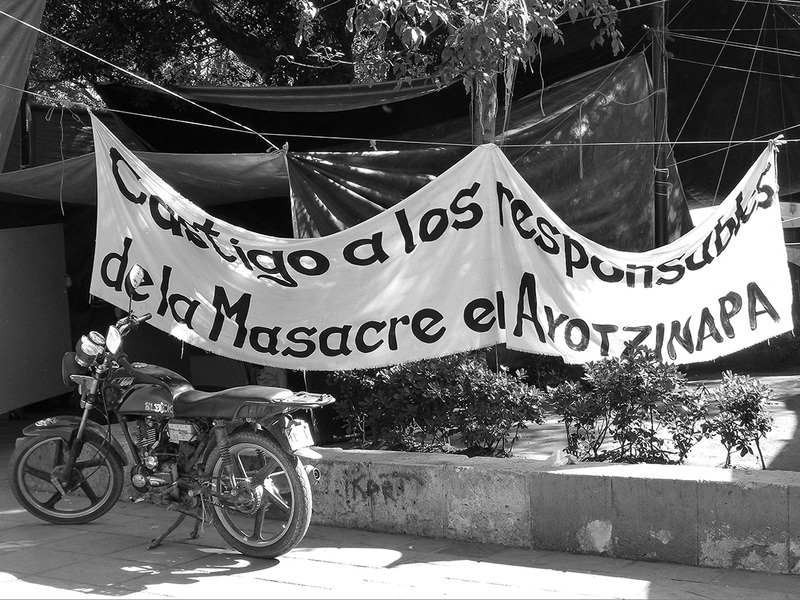 The country’s attention is focused on today’s Global Day of Action for Ayotzinapa. Many will wear black today to mourn the loss of students, journalists, and others to violence in Mexico. It is indeed a global event; Greek students have posted a video in support of the missing students and their families. They will be Standing in Solidarity in Salinas (California) and in at least 115 other cities around the world. And, in Oaxaca, among many other events, at 4 PM there will be a Festival Por la Vida at Santo Domingo, one of 231 actions listed on a Facebook page. Today Mexico is celebrating el Día de la Revolución (Revolution Day). It commemorates the beginning of the bloody revolution that quickly drove dictator/president Porfirio Díaz from his 31-year long reign. A November 22, 1910 headline in the Palestine [Texas] Daily Herald proclaimed, “Revolution Is Now On In Mexico: The Real Thing is Reported Under Way in State of Chihuahua, Mexico.” However, the civil war raged on for ten years, as various factions battled for power and the peasantry fought for, in the words of Emiliano Zapata, ¡Tierra y libertad! (Land and liberty!) It is estimated to have cost 1.9 to 3.5 million lives. The Government Palace was decked out in green, white, and red and the Governor, along with other dignitaries, presided from its balcony. As always, the bomberos (firefighters) received much applause as they passed by the crowds gathered along the parade route. Not so much love given to these guys from the Agencia Estatal de Investigaciones, an agency of Oaxaca’s Attorney General’s office.